Booking Calendar – provides an ultimate booking system for your WordPress site. Visitors to your site will be able to check availability and make reservations for specific day(s) or time slots. Your customers can even search available properties or services for the specific dates and pay online for their own bookings. 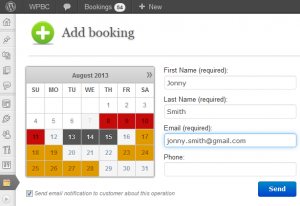 You will receive email notifications and can manage the reservations in the intuitive and powerful booking admin panel. Booking Calendar is built to work out of the box, but you can still freely configure different settings for the best fit to your business workflow processes and customize the form and calendar for a natural fit to your site design. Note! After purchase you will receive email with download link to your billing email (if you do not see email in inbox, please check your SPAM folder). If you will have some questions, you can contact directly for help.